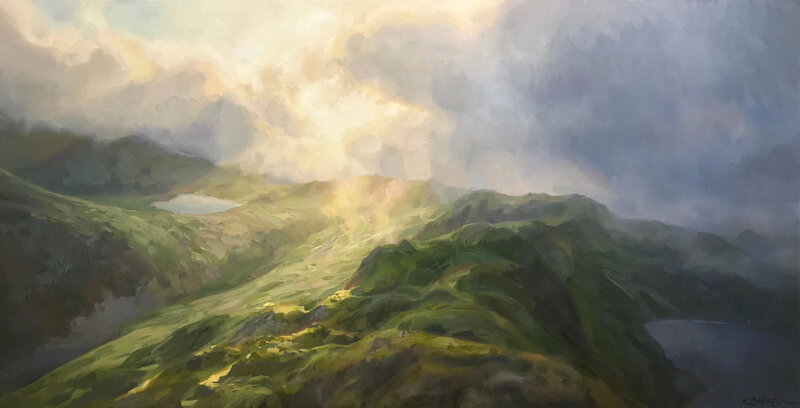 Light on the Land, oil on linen, 24 x 48 in. This Spring, Eisele Gallery will give Cincinnati a fresh take on fine art in the form of its highly anticipated exhibition Art of the International Parks. This exhibition will serve as a comprehensive exploration of different interpretations centered around the common theme of protected parks and preserved regions on the planet. The gallery will be featuring work by over 30 national and internationally recognized artists. Many of the artists in the exhibition have been published in the popular book Art of the National Parks: Historic Connections, Contemporary Interpretations, which will be available for purchase at the gallery. An opening reception, fundraiser and book signing will be held on Friday, April 12th from 5pm-8pm at Eisele Gallery. All of the work in the exhibition will be available for purchase. A portion of sales will be donated to benefit the SPCA of Cincinnati on opening night and by request. In addition, Limestone Branch Distillery will have a Yellowstone Select Bourbon tasting during the opening, also including opportunities to donate directly to the National Parks. The exhibition will run from April 12th – May 25th. Eisele Gallery strives to expose its clients and the community to a variety of internationally known artists, who focus on painting protected geographic areas such as National Parks. This theme consists of, but is not limited to, the canyons and mountain ranges of North America and Canada, the European mountain ranges, coastlines on all continents and protected seas and oceans. Many of the artists who paint these areas are actively engaged in protection and conservation aspects as well. The exhibition will survey different methods of fine art such as painting and photography in both traditional and contemporary methods. Within this show the gallery will create a comprehensive experience that incorporates the appreciation of art, education of nature and protection of animals. Eisele Gallery, located in Cincinnati, Ohio has long been recognized as one of the most respected fine art galleries in the Midwest. The gallery features a large selection of Traditional and Contemporary art and works with museum quality estates and collections. It’s renowned exhibition program fosters excellence within artistic practice, while promoting both emerging and established internationally and nationally recognized artists. The staff and volunteers of SPCA Cincinnati strive to give the animals in their care the best humane treatment and to continuously offer and develop programs to support those who own and care for animals. In addition to being the contracted agency that oversees stray dog control in the community, SPCA Cincinnati offers many programs and services, including animal adoptions, animal cruelty investigations, spaying and neutering shelter animals, companion animal and wildlife rescue, dog licensing, foster care program, obedience training, and the area’s most extensive humane education program. SPCA Cincinnati also works to introduce animals into the lives of people in our community, including those in hospitals, nursing homes, children’s homes, and schools, and works with victims of domestic violence to both provide shelter for their animals, and to help them rehabilitate.